As our applications grow and begin to carry out heavier computations, there comes an increasing need for speed ( ️ ) and the optimization of processes becomes a necessity. When we ignore this concern, we end up with programs that take a lot of time and consume a monstrous chunk of system resources during execution. Memoization is an optimization technique that speeds up applications by storing the results of expensive function calls and returning the cached result when the same inputs occur again. If this doesn’t make much sense to you yet, that’s okay. 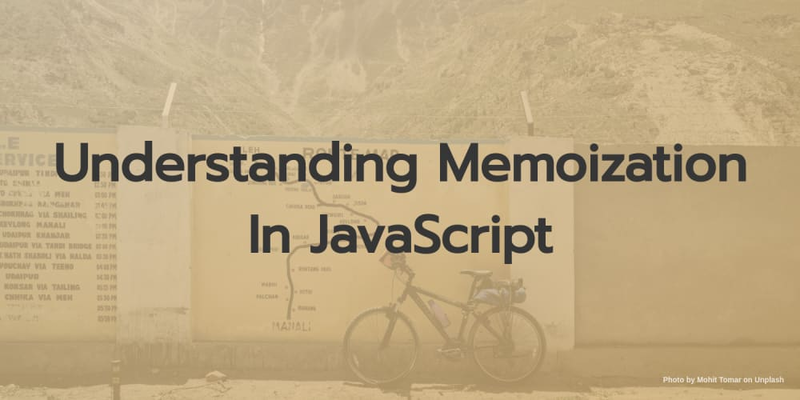 This article provides an in-depth explanation of why memoization is necessary, what it is, how it can be implemented and when it should be used. Memoization is an optimization technique that speeds up applications by storing the results of expensive function calls and returning the cached result when the same inputs are supplied again. Same definition again?  Let’s break it down this time. It is clear to us at this point that the aim of memoization is to reduce the time taken and amount of resources consumed in the execution of “expensive function calls”. What is an expensive function call? Don’t get confused, we aren’t spending money here. In the context of computer programs, the two major resources we have are time and memory. Thus, an expensive function call is a function call that consumes huge chunks of these two resources during execution due to heavy computation. However, as with money, we need to be economical. For this, memoization uses caching to store the results of our function calls for quick and easy access at a later time. A cache is simply a temporary data store that holds data so that future requests for that data can be served faster. Thus, when an expensive function has been called once, the result is stored in a cache such that whenever the function is called again within our application, the result would be returned very quickly from the cache without redoing any calculations. Imagine you were reading a new novel with a pretty attractive cover at the park. Each time a person passes by, they are drawn by the cover, so they ask for the name of the book and its author. The first time the question is asked, you turn the cover and read out the title and the name of the author. Now more and more people keep stopping by and asking the same question. You’re a very nice person  , so you answer them all. Would you turn the cover and read out the title and author’s name to each one of them, or would you begin to provide the response from memory? Which saves you more time? Notice the similarity? With memoization, when a function is provided an input, it does the required computation and stores the result to cache before returning the value. If this same input is ever received in the future, it wouldn&apos;t have to do it over and over again. It would simply provide the answer from cache(memory). Pretty simple, right? Now you want to know how it works? Let’s see! Not quite clear? I think so too. Looking carefully at the code above, we notice that the function bar has access to the variable a and b by virtue of the fact that it is nested inside of foo. Notice that we successfully store the function bar along with its environment. Thus, we say that bar has a closure over the scope of foo. You may understand this in the context of hereditary, in that an individual will have access to and exhibit inherited traits even outside of their immediate environment. This logic highlights another factor about closures, which leads into our second main concept. Functions that operate on other functions, either by taking them as arguments or by returning them, are called higher-order functions. Closures allow us to invoke an inner function outside its enclosing function while maintaining access to the enclosing function’s lexical scope(i.e identifiers in its enclosing function). Let’s make a little adjustment to the code in our previous example to explain this. Notice how the function foo returns another function bar. Observe that we execute the function foo and assign the returned value to baz. In this case however, we have a return function. Thus, baz now holds a reference to the bar function defined inside of foo. Remember that bar would always have access to variables in foo(inherited traits) even if it is executed outside of foo&apos;s scope (is far away from home). Concise and accurate indeed! But, there’s a problem. Notice that in consistently reducing the size of the problem(value of n ) until the terminating case is reached, a lot more work is done and time consumed to arrive at our solution because there is a repetitive evaluation of certain values in the sequence. Looking at the diagram below, when we try to evaluate fib(5), we notice that we repeatedly try to find the Fibonacci number at indices 0, 1, 2 and 3 on different branches. This is known as redundant computation and is exactly what memoization stands to eliminate. Now let’s fix this with memoization. In the code snippet above, we adjust the function to accept an optional parameter known as memo. We use the memo object as a cache to store the Fibonacci numbers with their respective indices as key to be retrieved whenever they are required later in the course of execution. Here, we check if memo was received as an argument when the function was called. If it was, we initialize it for use, but if it wasn&apos;t, we set it to an empty object. Next, we check if there&apos;s a cached value for the current key n and we return its value if there is. As in the solution before, we specify a terminating case for when n is less than or equal to 1. At the end we recursively call the function with a smaller value of n, while passing in the cached values(memo) into each function, for use during computation. This ensures that when the value has been evaluated before and cached, we do not perform such expensive computation a second time. We simply retrieve the value from cache memo. Notice that we add the final result to the cache before returning it. Lets see how much better we’ve made things!  Wow!!! This is super impressive. The memoized fibonacci function is the fastest as expected. However, by how much is quite astonishing. It executes 126,762 ops/sec which is far greater than the purely recursive solution which executes 1,751 ops/sec and is approximately 99% slower. Note: “ops/sec" stands for operations per second. That is how many times a test is projected to execute in a second. Now we’ve seen just how much memoization can impact the performance of our applications on a functional level. Does this mean that for every expensive function within our application, we would have to create a variation that is modified to maintain an internal cache? No. Recall that we learnt that by returning functions from functions, we cause them to inherit the scope of their parent function even when executed outside? This makes it possible to transfer certain features and properties(traits) from the enclosing function to the function that is returned. Let’s apply this to memoization as we write our own memoizer function. In the code snippet below, we create a higher order function called memoizer. With this function, we will be able to easily apply memoization to any function. Above, we simply create a new function called memoizer which accepts the function fun to be memoized as a parameter. Within the function we create a cache object for storing the results of our function executions for future use. From the memoizer function, we return a new function which can access the cache no matter where it is executed due to the principle of closure as discussed above. Within the returned function, we use an if..else statement to check if there is already a cached value for the specified key(parameter) n. If there is, we retrieve it and return it. If there isn’t, we calculate the result using the function to be memoized fun . Afterwards, we add the result to the cache using the appropriate key n , so that it may be accessed from there on future occasions. At the end, we return the calculated result. To apply the memoizer function to the recursive fibonacci function initially considered, we call the memoizer function passing the function as an argument.    No way!!!! Our memoizer function produced the fastest solution with 42,982,762 ops/sec. The previous solutions considered are 100% slower. As regards memoization, we have now considered the what, why and how. Now let&apos;s take a look at the when. For expensive function calls i.e functions that carry out heavy computations. For functions with a limited and highly recurring input range such that cached values don&apos;t just sit there and do nothing. For recursive functions with recurring input values. For pure functions i.e functions that return the same output each time they are called with a particular input. All done! You get it now don&apos;t you? Here are some libraries that provide memoization functionality. With memoization, we are able to prevent our function from calling functions that re-calculate the same results over and over again. It’s now time for you to put this knowledge to work.